French tosafist; lived at Corbeil in the second half of the thirteenth century; died before 1298, probably in 1295; son of the Talmudist Elijah of Tours. In Talmudical literature he is designated by the abbreviations "RaP" (= Rabbi Perez), "RaPaSh" (= Rabbi Perez, may he live), and "MaHaRPaSh" (= our master Rabbi Perez, may he live). He had for masters R. Jehiel of Paris and Samuel of Evreux. Perez traveled throughout Brabant, and sojourned for a time in Germany, where he made the acquaintance of Meïr of Rothenburg. On his return home he delivered lectures on Talmudical subjects. These lectures were attended by the most celebrated rabbis of the fourteenth century; and his fame as a Talmudical authority became universal, his commentaries being studied in France, Germany, and Spain. Perez was the author of the following works: (1) Glosses on the "'Ammude ha-Golah" of Isaac of Corbeil, published together with the text, Cremona, 1556. (2) Commentaries on the greater part of the Talmud. These commentaries, variously entitled "Tosafot," "Shiṭṭah," "Nimuḳim," "Ḥiddushim," "Perishah," underwent many changes introduced by Perez's numerous disciples; only the commentary on the treatise Baba Meẓi'a has been preserved in its original redaction. 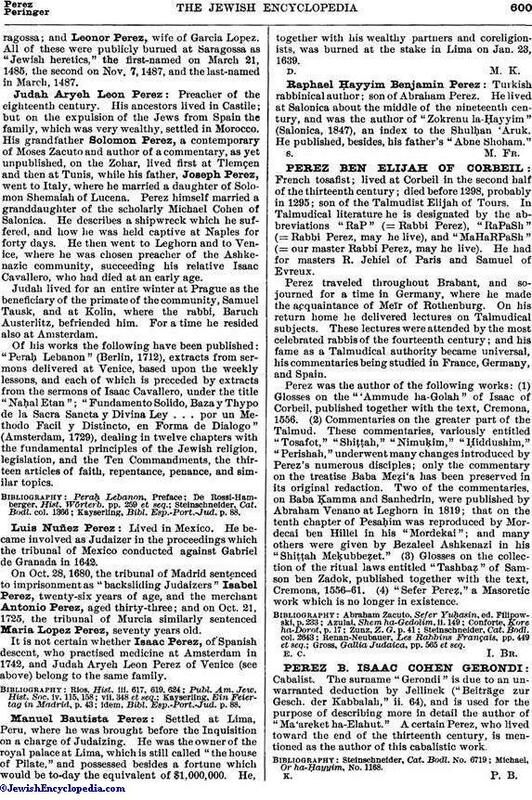 Two of the commentaries, on Baba Ḳamma and Sanhedrin, were published by Abraham Venano at Leghorn in 1819; that on the tenth chapter of Pesaḥim was reproduced by Mordecai ben Hillel in his "Mordekai"; and many others were given by Bezaleel Ashkenazi in his "Shiṭṭah Meḳubbeẓet." (3) Glosses on the collection of the ritual laws entitled "Tashbaẓ" of Samson ben Zadok, published together with the text, Cremona, 1556-61. (4) "Sefer Pereẓ," a Masoretic work which is no longer in existence. Gross, Gallia Judaica, pp. 565 et seq.